It takes approximately 20 seconds to put our food into take out containers. As the packaging can remain in our landfills forever, how can that possibly be considered convenient?! When taking out, refuse the unnecessary packaging! Think about the containers, spoons, forks, straws, and napkins that you get served (why do they give you enough for a family of 20 when eating alone?). Ask yourself, “Do I really need all of this?”, “Am I going to be eating this right away?” (If so, why take the bag or the napkins?). Bring your own reusables (BYOR) and you won’t need to use the can – garbage, that is. Bring your own containers (like Wean Green), straws, cutlery, mugs, bottles and bag – check out this Guide for ideas on how to pack eco-delicious lunches – http://bit.ly/uqCZxG . It’s easy to fall into a routine, so why not create a new one? Reconsider and readjust your habits and adopt healthier eating strategies – it might be challenging at first – but it will save you time, money, your health, and our world. The bonus? You’ll feel like an eco-hero and will inspire others around you to follow suit. Together we can change the outrageous amount of unnecessary waste we create everyday as well as drastically reduce it. Take action and join the TakeOutWithOut Campaign (www.takeoutwithout.org). 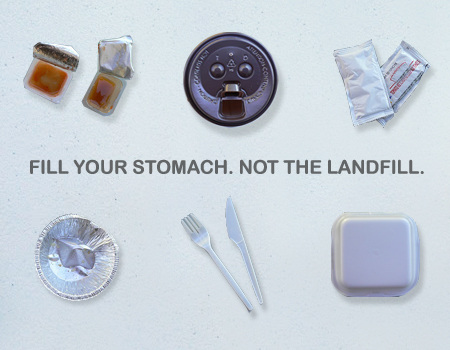 You can eat up and fill up, and leave our landfills alone. This entry was written by Melissa, posted on November 30, 2011 at 6:57 am, filed under Wean Team and tagged environment, expert advice, lisa borden, litterless lunch, takeout without. Bookmark the permalink. Follow any comments here with the RSS feed for this post. Comments are closed, but you can leave a trackback: Trackback URL.